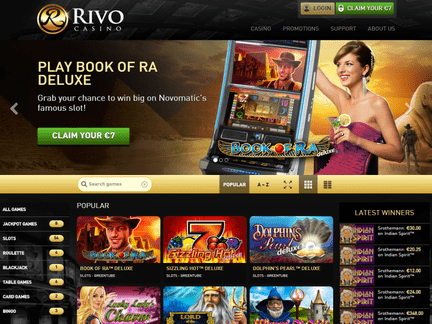 Rivo Casino's main page contains images of traditional slot machines in the background. This suggests that the casino wants to assure the player that a web casino can resemble a traditional casino in significant ways, perhaps even providing superior entertainment and more convenience! A promise of a luxurious casino experience is made explicit in the „about us" section. As with other online casinos, the customer experience is made out to be the number one priority. Any serious evaluation of the casino must take the casino at its word and investigate whether the advertised superior form of service has indeed been achieved. The elite casino enthusiasts who are in charge of the casino are counting on a good response from players. The promotions area of the website contains just two promotions. Since the section isn't very large, the question is whether the two deals are good enough to warrant the bestowal of the title of 'luxurious casino'. 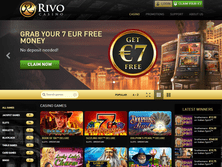 The first Rivo Casino Bonus deal is a €7 free money bonus. No deposit is required. However, the registration with the casino is necessary. A four digit mobile code is sent to the player as soon as the application has been forwarded. Mobile activation requires the insertion of a code. The money will be found on the account after the completion of the quick process. But the welcome bonus is the real highlighht for the casino. This is the deal that is most often compared across online casinos. So what does the website have in store? A 100% up to €777 is provided on the first deposit. This is a nice welcome bonus offer. Whether this single offer makes up for the lack of other deals is a real dilemma for players. The website makes it clear that visitors from the United States may not participate in the real money gambling activities. The adoption of the € currency shows that the online casino is appealing to the European player. However, Rivo Casino has also welcomed players from other parts of the world. In terms of language support, the drop-down meny displays the following languages; French, German, Romanian, Russian and Hungarian. Finally, the players can find out about the most popular games! Such a category is featured in the game display section. A number of game titles have been highlighted. Here are a few of them; Book of Ra Deluxe, Sizzling Hot Deluxe, Dolphin's Pearl Deluxe, Lucky Lady's Charm Deluxe, Lord of the Oceean, Wizard of Odds, Book of Ra, Katana, Power Stars, Rumpel Wildspins, Pharaoh's Tomb, Colombus Deluxe, European Roulette, Black Jack, Chicago, Cleopatra, Jolly Fruits, Indian Spirit, Cash Farm, Big Catch, Secret Elixir, Sharky, Golden Ark & Vegas Roulette. The website has neatly categorized the games. They fall into the following sub-categories; Jackpot Games, Slots, Roulette, Blackjack, Table Games, Card Games & Bingo. The players from across the globe have participated in the games on the site. Negative opinions have not shown up on public forums. This is a relatively new casino. Therefore, the lack of public forum postings should not be surprising. It usually takes a bit of time before a casino gains some level of player recognition. E-mail support is offered in the support section. A message can also be left on the main page. The casino brand belongs to OceanLink N.V., which is a company operating in Curacao. The license that has been obtained would not impress most online casino specialists. The process of obtainng it isn't a challenge. So while the casino can claim legal authority, it cannot claim that it has been rigorously examined before a license was issued. The casino does not have a long history of operations. The promised luxurious casino experience was a bit of an exaggeration. While the casino does provide a number of interesting games, I could not feel fully confident in this Curacao-licensed venue, especially when I realized how easy it is to get a business license from this place. The promotional deals were likewise falling short of the standard that was announced. While the venue is still a solid option, it is not even close to the top casino category.